BROTECT® AirGlass® Glass Screen Protector for FiiO X1 II. BROTECT® AirGlass® Premium Glass Screen Protector, the Extra-Hard and Ultra-Light sidekick for your FiiO X1 II! Product Video BROTECT® AirGlass® Premium Glass Screen Protector - YouTube. 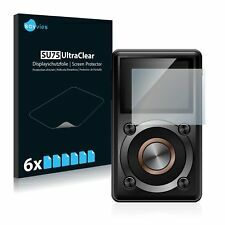 6x Savvies® SU75 Screen Protector for Sony Walkman NWZ-ZX1. 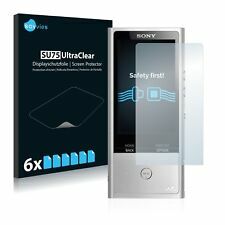 Savvies UltraClear Screen Protector for Sony Walkman NWZ-ZX1: Crystal-Clear, easy application, excellent price quality ratio. The Savvies® SU75 UltraClear screen protectors are manufactured in Germany with the latest high-precision laser machinery. 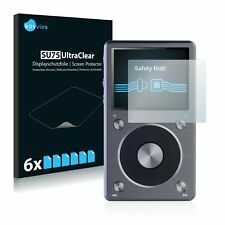 6x Savvies® SU75 Screen Protector for Sony NW-ZX100HN. Savvies UltraClear Screen Protector for Sony NW-ZX100HN: Crystal-Clear, easy application, excellent price quality ratio. The Savvies® SU75 UltraClear screen protectors are manufactured in Germany with the latest high-precision laser machinery. Ultra-clear and shock absorbing: atFoliX 3 x FX-Shock-Clear Anti Shock Screen Protector FiiO M3K - Made in Germany! shipped and sold by @FoliX - Original and directly from the manufacturer! Mounting accessories included cleaning cloth installation tool (squeegee) Dust remover sticker Link to the multilingual, illustrated mounting instructions (including mounting video) . Fingerprints and dirt can be removes easily from the film screen protector Mikvon SuperClear for Fiio X7. Mikvon SuperClear -. Enjoy with our crystallineSuperClear Film screen protector Fiio X7 absolute colors fidelity and optics. Mikvon films screen protector Clear for Fiio X7. 2x Mikvon films screen protector Clearfor. Fingerprints and dirt can be removes easily from the film screen protector Mikvon Clear for Fiio X7. Enjoy with ourClear film screen protector Fiio X7 absolute colors fidelity and optics. Ultra-clear and shock absorbing: atFoliX 3 x FX-Shock-Clear Anti Shock Screen Protector FiiO X7 Mark II - Made in Germany! shipped and sold by @FoliX - Original and directly from the manufacturer! Mounting accessories included cleaning cloth installation tool (squeegee) Dust remover sticker Link to the multilingual, illustrated mounting instructions (including mounting video) . Ultra-clear and shock absorbing: atFoliX 3 x FX-Shock-Clear Anti Shock Screen Protector FiiO M3 - Made in Germany! shipped and sold by @FoliX - Original and directly from the manufacturer! Mounting accessories included cleaning cloth installation tool (squeegee) Dust remover sticker Link to the multilingual, illustrated mounting instructions (including mounting video) . Ultra-clear and shock absorbing: atFoliX 3 x FX-Shock-Clear Anti Shock Screen Protector FiiO X3 II - Made in Germany! shipped and sold by @FoliX - Original and directly from the manufacturer! Mounting accessories included cleaning cloth installation tool (squeegee) Dust remover sticker Link to the multilingual, illustrated mounting instructions (including mounting video) . Mikvon films screen protector Clear for Fiio X7. 4x Mikvon films screen protector Clearfor. Fingerprints and dirt can be removes easily from the film screen protector Mikvon Clear for Fiio X7. Enjoy with ourClear film screen protector Fiio X7 absolute colors fidelity and optics. Mikvon films screen protector Clear for Fiio X7. 6x Mikvon films screen protector Clearfor. Fingerprints and dirt can be removes easily from the film screen protector Mikvon Clear for Fiio X7. Enjoy with ourClear film screen protector Fiio X7 absolute colors fidelity and optics. Ultra-clear and shock absorbing: atFoliX 3 x FX-Shock-Clear Anti Shock Screen Protector FiiO M7 - Made in Germany! shipped and sold by @FoliX - Original and directly from the manufacturer! Mounting accessories included cleaning cloth installation tool (squeegee) Dust remover sticker Link to the multilingual, illustrated mounting instructions (including mounting video) . Ultra-clear and shock absorbing: atFoliX 3 x FX-Shock-Clear Anti Shock Screen Protector FiiO X3 Mark III - Made in Germany! shipped and sold by @FoliX - Original and directly from the manufacturer! Mounting accessories included cleaning cloth installation tool (squeegee) Dust remover sticker Link to the multilingual, illustrated mounting instructions (including mounting video) . Ultra-clear and shock absorbing: atFoliX 3 x FX-Shock-Clear Anti Shock Screen Protector FiiO X1 II - Made in Germany! shipped and sold by @FoliX - Original and directly from the manufacturer! Mounting accessories included cleaning cloth installation tool (squeegee) Dust remover sticker Link to the multilingual, illustrated mounting instructions (including mounting video) . Ultra-clear and hard-coated: atFoliX 3 x FX-Clear Screen Protector FiiO X1 II - Made in Germany! shipped and sold by @FoliX - Original and directly from the manufacturer! Mounting accessories included cleaning cloth installation tool (squeegee) Dust remover sticker Link to the multilingual, illustrated mounting instructions (including mounting video) . Ultra-clear and shock absorbing: atFoliX 3 x FX-Shock-Clear Anti Shock Screen Protector FiiO X7 - Made in Germany! shipped and sold by @FoliX - Original and directly from the manufacturer! Mounting accessories included cleaning cloth installation tool (squeegee) Dust remover sticker Link to the multilingual, illustrated mounting instructions (including mounting video) . Ultra-clear and hard-coated: atFoliX 3 x FX-Clear Screen Protector FiiO M3K - Made in Germany! shipped and sold by @FoliX - Original and directly from the manufacturer! Mounting accessories included cleaning cloth installation tool (squeegee) Dust remover sticker Link to the multilingual, illustrated mounting instructions (including mounting video) . Ultra-clear and hard-coated: atFoliX 3 x FX-Clear Screen Protector FiiO M3 - Made in Germany! shipped and sold by @FoliX - Original and directly from the manufacturer! Mounting accessories included cleaning cloth installation tool (squeegee) Dust remover sticker Link to the multilingual, illustrated mounting instructions (including mounting video) . Ultra-clear and shock absorbing: atFoliX Set of 3 FX-Shock-Clear Anti Shock Screen Protector FiiO X5 III - Made in Germany! incl. front and back shipped and sold by @FoliX - Original and directly from the manufacturer! Mounting accessories included cleaning cloth installation tool (squeegee) Dust remover sticker Link to the multilingual, illustrated mounting instructions (including mounting video) . Ultra-clear and shock absorbing: atFoliX 3 x FX-Shock-Clear Anti Shock Screen Protector FiiO X5 II - Made in Germany! shipped and sold by @FoliX - Original and directly from the manufacturer! Mounting accessories included cleaning cloth installation tool (squeegee) Dust remover sticker Link to the multilingual, illustrated mounting instructions (including mounting video) . Ultra-clear and hard-coated: atFoliX 3 x FX-Clear Screen Protector FiiO X7 - Made in Germany! shipped and sold by @FoliX - Original and directly from the manufacturer! Mounting accessories included cleaning cloth installation tool (squeegee) Dust remover sticker Link to the multilingual, illustrated mounting instructions (including mounting video) . Ultra-clear and hard-coated: atFoliX 3 x FX-Clear Screen Protector FiiO X3 II - Made in Germany! shipped and sold by @FoliX - Original and directly from the manufacturer! Mounting accessories included cleaning cloth installation tool (squeegee) Dust remover sticker Link to the multilingual, illustrated mounting instructions (including mounting video) . Ultra-clear and hard-coated: atFoliX 3 x FX-Clear Screen Protector FiiO X5 II - Made in Germany! shipped and sold by @FoliX - Original and directly from the manufacturer! Mounting accessories included cleaning cloth installation tool (squeegee) Dust remover sticker Link to the multilingual, illustrated mounting instructions (including mounting video) . Ultra-clear and shock absorbing: atFoliX 3 x FX-Shock-Clear Anti Shock Screen Protector FiiO M9 - Made in Germany! shipped and sold by @FoliX - Original and directly from the manufacturer! Mounting accessories included cleaning cloth installation tool (squeegee) Dust remover sticker Link to the multilingual, illustrated mounting instructions (including mounting video) . Ultra-clear and hard-coated: atFoliX 3 x FX-Clear Screen Protector FiiO M7 - Made in Germany! shipped and sold by @FoliX - Original and directly from the manufacturer! Mounting accessories included cleaning cloth installation tool (squeegee) Dust remover sticker Link to the multilingual, illustrated mounting instructions (including mounting video) . Ultra-clear and hard-coated: atFoliX 3 x FX-Clear Screen Protector FiiO M9 - Made in Germany! shipped and sold by @FoliX - Original and directly from the manufacturer! Mounting accessories included cleaning cloth installation tool (squeegee) Dust remover sticker Link to the multilingual, illustrated mounting instructions (including mounting video) . Ultra-clear and hard-coated: atFoliX 3 x FX-Clear Screen Protector FiiO X7 Mark II - Made in Germany! shipped and sold by @FoliX - Original and directly from the manufacturer! Mounting accessories included cleaning cloth installation tool (squeegee) Dust remover sticker Link to the multilingual, illustrated mounting instructions (including mounting video) . Ultra-clear and hard-coated: atFoliX 3 x FX-Clear Screen Protector FiiO X3 Mark III - Made in Germany! shipped and sold by @FoliX - Original and directly from the manufacturer! Mounting accessories included cleaning cloth installation tool (squeegee) Dust remover sticker Link to the multilingual, illustrated mounting instructions (including mounting video) .